"We discovered that this range above 10 joules per square centimeter, particularly for UV laser pulses, was behaving very differently than lower fluences and longer wavelengths," said Jeff Bude, NIF & Photon Science deputy principal associate director for Science & Technology. "The removal rate jumps when you go beyond 10 joules per square centimeter, and especially for the UV light," Bude said. "At the same time the jump in the removal is accompanied by an increase in the removal efficiency—a reduction in the amount of energy required to remove a given volume of material. "That was really intriguing to us; it suggested that maybe there's a different mechanism going on here. So we decided picosecond laser ablation would provide a good test case to probe ablation physics in a regime that was not well understood." The study is thought to be the first comprehensive look at the picosecond-pulse laser ablation process. 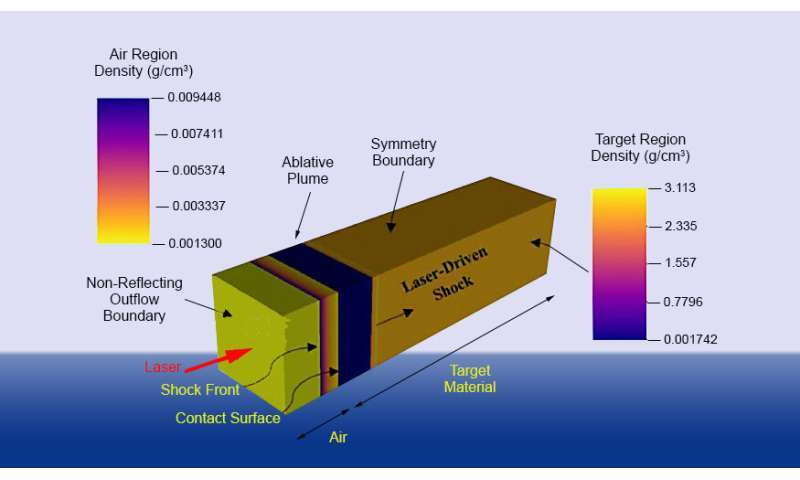 Selected as an "Editor's Pick" by the Journal of Applied Physics editors, the research was part of an ongoing Laboratory Directed Research and Development (LDRD) study of pulsed-laser material modification led by Bude. "The removal mechanism—shock heating creating a melt and then removing that with cavitation—requires less energy to remove material than vaporization of the material," Bude said. "That's the explanation for why it's more efficient." "This discovery was really facilitated by our unique modeling and simulation capability here at the Lab," said LLNL analyst Wes Keller, lead author of the paper. "This was a particularly challenging problem to model because the laser energy deposition process was closely coupled with the material hydrodynamic response, requiring a unique code like HYDRA that has this integrated capability." "When you're trying to understand picosecond laser processing, some of the simplifying assumptions of the physics that you get with very short (femtosecond) pulses are no longer reliable," Bude said. Rather than simply absorbing the laser energy and vaporizing, "the material was moving, it was evolving in the laser plume," he said. This meant that the models had to be tweaked to account for both the hydrodynamics of the melting material and the interactions between the laser pulse and the plasma (ionized gas) in the ablative plume. "We really needed to model laser-plasma interaction correctly," Bude said, "so we had to do a lot of creative experiments to fix some inadequacies in the model. Ultimately, we were able to identify the essential physics of this regime, and we discovered that you have to have shock heating to create micron-deep melt. And then after you create this deep melt with shock heating you need a mechanism to remove it, and we discovered that that mechanism was cavitation." Once they realized that temporally shaped, or timed, pulses could exploit the instabilities in the melted material, the researchers were able to use shaped pulses to create a more efficient way to remove material. "We were able to leverage this understanding to do laser processing a different way," Bude said, "so it actually had a lot of spinoff benefits," some of which will be detailed in additional papers now in preparation. "There is some indication," Bude said, "that in the regime of picosecond to tens of picoseconds (pulses) you can get the same sort of quality and behavior in your laser cutting, drilling and shaving functions that you could with more expensive lasers operating at less than a picosecond." The findings thus could lead to new or more efficient laser applications in industry, national defense, medicine and many other fields.